The destruction of ozone is accelerated by certain trace gases containing nitrogen, hydrogen, bromine, and chlorine. These are referred to as ozone depletion chemicals. Consumption of ozone depleting substances expressed as million tonnes of ozone depletion potential (ODP), 1989-2009. The most commonly known ozone depletion chemicals (ODCs) are the CFCs or chlorofluorocarbons. Over the last 30 years man-made CFCs have been the main cause of stratospheric ozone depletion. CFCs however, are not the only ozone-depleting chemicals. Other ODCs include the methylhalides, carbon tetrachloride (CCl4), carbon tetrafluoride (CF4), and the halons which contain bromine instead of chlorine. Such compounds are called halocarbons. Carbon tetrachloride (CCl4), despite its toxicity, was first used in the early 1900s as a fire extinguishing agent, and more recently as an industrial solvent, an agricultural fumigant, and in many other industrial processes including petrochemical refining, and pesticide and pharmaceuticals production. Recently it has also been used in the production of CFC-11 and CFC-12. Methyl chloroform, also known as 1,1,1 trichloroethane is a versatile, all-purpose industrial solvent used primarily to clean metal and electronic parts. It was introduced in the 1950s as a substitute for carbon tetrachloride. Halons, unlike CFCs, contain bromine, which also destroys ozone in the stratosphere. Halons are used primarily in fire extinguishers. 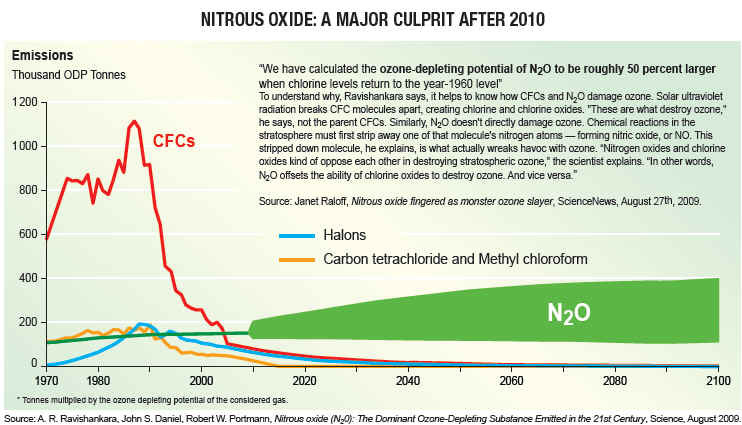 Halon-1301 has an ozone depleting potential 10 times that of CFC-11. Although the use of halons in developed countries has been phased out since 1996, the atmospheric concentration of these potent, ozone destroyers is still rising because of their long atmospheric lifetimes. Methyl bromide, another bromine-containing halocarbon, has been used as a pesticide since the 1960s.